Policy Sciences presents the framework of situational normativism, a descriptive-normative methodology by which the components of policy sciences may be pragmatically integrated and applied to real decision problems. The uniqueness of this approach derives from the integration of behavioral, political, and social considerations with a broad range of systems and quantitative methodologies. Furthermore, this approach encompasses specific considerations of implementation, political feasibility, and organization redesign. Organized into three parts, this book begins with an overview of policy sciences followed by a description of the adaptive analytical framework of situational normativism. 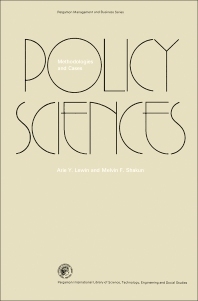 Policy making is considered as a process of adaptation and a policy-making system generally composed of two or more coupled policy makers, each of whom is viewed as an adaptive purposeful system, is described. The last part consists of nine original cases that demonstrate the application of specific methodologies to real-world problems within the framework of situational normativism. Three of the case studies focus on the zoning decision process in the city of Pittsburgh; the use of a Delphi procedure to isolate and define the influential goals of an organization; and national policies toward foreign private investment. This monograph is intended for senior undergraduates and graduates taking a course in policy sciences and inter-organizational decision making and similar courses. Case 6. McKinley, J.K., and Coppoc, W.J., “Statement by Texaco, Inc., to the Air and Water Pollution Subcommittee of the Senate Public Works Committee,” June 26, 1973.